Note: This is a guest article contributed by plastics engineer and owner of Polymeric Life, Noah. Today I found out where the word plastic came from. The word plastic existed long before the first plastic, Parkesine. As early as the 1600’s, plastic was used as a term to relate to something that could be easily molded or shaped. Plastic is derived from the Latin word plasticus and the Greek word plastikos, both meaning ‘able to be molded, pertaining to molding’. Most likely, Greeks used plastikos to describe unhardened versions of clay. The first plastic was developed in 1855 to replace ivory. A man by the name of Alexander Parkes came up with the idea, presented it at the 1862 Great Exhibition in London, and came home with third prize. This particular plastic was referred to as parkesine. Later, manufactured parts of parkesine would suffer as Parkes tried to make the manufacturing process more cost effective. Xylonite would later replace parkesine as a more stable material. Alexander Parkes holds a total of 66 patents. The first synthetic plastic was invented in 1909 by Leo Hendrik Baekeland and was called Bakelite. It was developed from phenol and formaldehyde (what a lovely combo!). Bakelite is considered the first true plastic because it is synthetic (not based on any natural material). Plastics, as we refer to them today, are mainly derived from a petroleum source; oil that has been taken from the Earth, broken down, and parts of that oil are then used to make plastic. The Bic pen is made of polystyrene plastic and was first manufactured in 1950. To date, there have been more than 100 billion of these pens manufactured. The first form of plastic molding was casting. This process typically involves two female molds clamped together. A liquid material (in our case, plastic) is then poured into the mold. 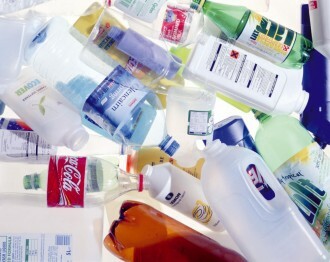 On average, Americans use about four million plastic bottles per hour, about 27% of which get recycled for an annual recycle rate of about 2.4 billion pounds of plastic from plastic bottles per year. It takes only five recycled two liter bottles to make enough fiberfill for one ski jacket. It takes about 1000 recycled milk jugs to make a six foot park bench.